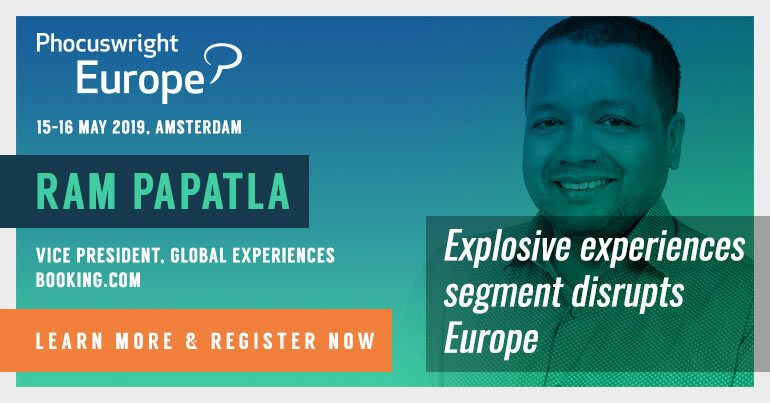 Instrumental in building the online giant to what it is today from his role of SVP international to stepping up to take the helm just under two years ago, the Booking Holdings chief features in an executive interview at the Phocuswright Conference 2018. Why isn’t the travel startup survival rate higher? I haven’t looked at any data that would indicate travel startups have higher or lower survival rates than the rate for startups in general. Looking at VC funding for the last few decades, we know the majority of startups fail, but I don’t know if travel-related startups have higher failure rates than say biotech startups or any other types of startups. I speak to customers all the time. Whenever I meet someone and they ask what do I do, I just say I am in travel and that’s a subject that people love to talk about. Almost always, a person has heard of at least one of our brands and many times the person has also used at least one of our brands. Sometimes they ask me what do I do specifically, and when I tell them, more than once I get a look that says they want to blurt out, “I would have thought the CEO would be, well, more CEOish,” but I hope that this is because my attire tilts towards the very casual and not because of what I say. What is the most critical component of your business (after/apart from people, tech, customers)? But it does all come down to the people. We are a service company. We are nothing without the people – the customers, the supplier partners and the employees. Maybe for a coal company, the critical part is the coal in the ground but for us it is all about the people. That people won’t really mind if you exercise quietly in the plane aisle on a trans-Pacific flight. Apparently, some people do mind. And some people mind a lot. To be a writer. I actually wrote a novel in the nineties and got some of very creative rejection letters from agents and publishing houses. One that I recall said, “Derivative and not very good.” Because back then you had to print out the manuscripts and send them to agents, a lot of trees died for a doomed cause. There are so many people I greatly admire it would be unfair to mention only one. Less time available for family and friends. Also, I travel so much that when it is time for a vacation, sometimes I am not as excited as the rest of the family to get on a plane. Well, first want to mention the current brands in our organization: Booking.com, Priceline.com, Kayak, Agoda, Rentalcars.com, OpenTable, Momondo and Rocketmiles. Didn’t think of any of them, but am very thankful someone did. Outside our organization, industry developments like ride-hailing and home-sharing are, of course, great advancements for travel that I (and everyone else no doubt) should have seen the opportunity but did not. And then something I use all the time, Waze, which has probably saved me hundreds of hours of traffic jams. Finally, while autonomous vehicles are not at Level 5 yet, this innovation will have significant net positive societal change so great admiration for everyone working on the problems and solutions in this area. I’d be back where I spent the first two decades of my career in finance. I enjoyed so many elements of that industry: the speed, the complexity, the variation in problems to solve so it never got boring. We go on a lot of family active holidays: biking, hiking, kayaking, white-water rafting. And in North America, we have done it camping-style, while outside North America we stay in hotels, and we have loved them all. The first one we did was camping in Yellowstone National Park and the Grand Tetons (outside Jackson Hole, WY), and we learned to climb with Exum Mountain Guides, rafted down the Snake River, kayaked on Yellowstone Lake and biked and hiked all over. It still ranks up as our favorite vacation. 1. Use your time wisely, it is a depleting asset that you will never get more of, and 2. Be bold/take risks - failure is OK. Without the improvements in AI over the last two decades, our world would be very different right now. And because of the further progress that will be made in AI, the next two decades will be even more different. Do you agree with the often used phrase “travel planning is broken”? I put that in the category of hyperbole. Yes, travel and travel planning can be improved so, so much, but think how much better it is now than it was five, 15 and 30 years ago. Before there were smartphones, before there was an internet, before GPS, before there were desktop computers, etc. travel planning and traveling were really hard. I am 56 years ago, and I remember going to Europe and Asia in the 1980s and the problems in the planning process and the frustrations when you were traveling. If people want to say travel and travel planning is broken now, how does one characterize what it was in 1985 when I took my first trip to China? The thing I want now, though, is the benefit of the old-time human travel agent who knew everything about me combined with all the instant information and connectivity we have to ensure that everything is transacted immediately, seamlessly and frictionlessly. Plus, if anything goes wrong, the appropriate changes and fixes are made with minimal intervention by me. To achieve this, create this system, will require substantial technological advances in areas such as AI and massive interactivity with other systems. Only the biggest players will be able to create this holistic super-system, but when it is done travel and travel planning will be substantially improved and the company that creates this first will have a substantial competitive advantage. I hope we get there first. Think back to five years ago, did you envision this is where you would be? 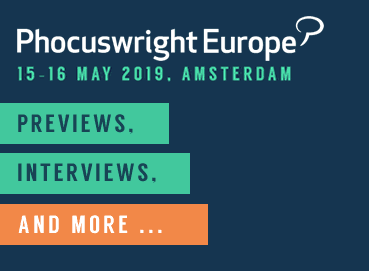 The day the Phocuswright Conference starts, November 13, will be five years and a week since we announced that Jeff Boyd would be retiring from the CEO position at our company. If someone had then predicted that at this time in 2018, I will have been CEO of Booking Holdings for almost two years, I would have suggested they take their crystal ball in for servicing. But that is the nature of all business and life, too. The future is not deterministic, but highly chaotic. That being said, we can’t leave business or life simply to chance. We still have to do all we can to improve the probabilities of achieving the results we want. I was very fortunate that I was born in a wonderful area, a suburb of New York City, with loving parents who though they did not have college degrees valued education highly and taught me the principle that hard work might not get you what you want, but you will have a higher chance of getting it, if you work hard. So I have tried to do the best I can, and through many random decisions and events that I had nothing to do with, from the teachers I had, to the people I met, to the woman, Amy, that I was so lucky to marry, etc. etc., I am now where I am. Or if you want a shorter answer: No, I did not envision this five years ago.